Click on any map to get the full-sized version. A world map showing New Alliance Weyrs and other key places. This map is not complete and is subject to updates. For an idea of scale, know that the Sea of Azov is roughly 464 miles across at its widest point. The Pernese probably have little use for delineated time zones, but this should be useful to anyone who's ever wondered what time it should be on another part of the planet. I chose the Harper Hall over Landing as the approximate site of the Prime Meridian for a couple of reasons. One, Fort has been settled for much longer than Landing and, of course, has the distinction of being the first settlement of the Northern Continent. Two, the Harpers are most likely to care about this sort of thing. An overview of the Roanoke River area. The scale is 64 miles to the inch on the main part, 464 miles to the inch on the inset. Yes, that is the Eastern Barrier Range to the west. Blame Southern Weyr. Galen Weyr in its entirety. The scale is 32 miles to the half-inch on the inset and 640 feet to the inch on the main part, though there may be some exaggeration of the structures. At this scale, anything less than 40 feet (1/16 inch) doesn't really register. 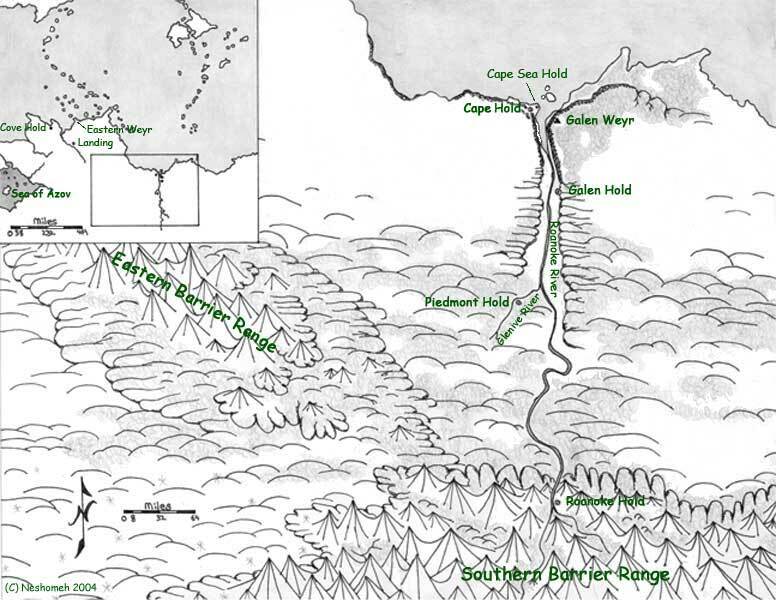 For that reason I did not bother to draw the Lower Caverns in detail, simply outlining the general area instead. The Galen Weyr cliff face. the Lower Caverns and the tunnel. The weyr with steps climbing to its ledge on the left is the Senior Weyrwoman's. 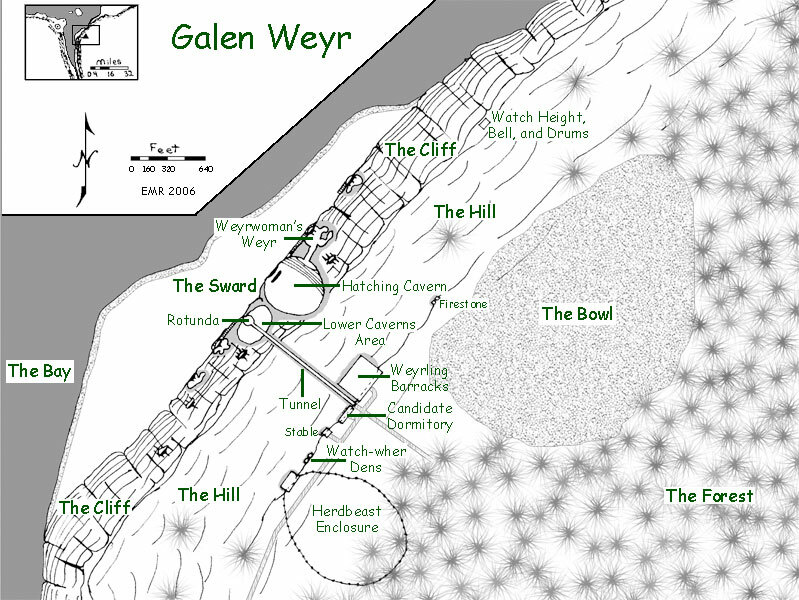 The Lower Caverns of Galen Weyr. The scale is 32 feet to one inch. 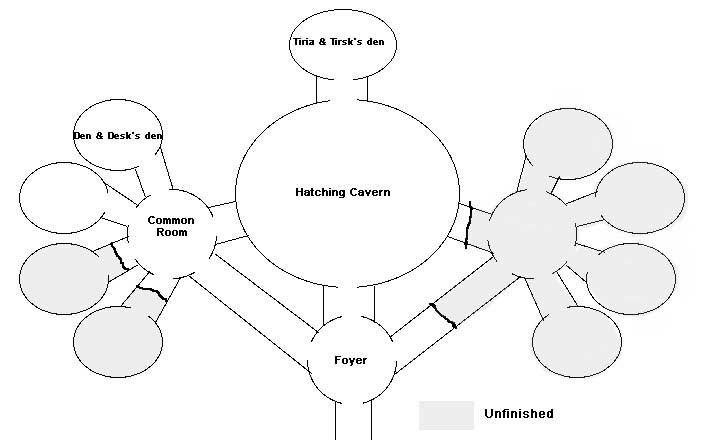 The candidate dormitory, kindly drawn and submitted by Daemonkat on May 22, 2006. 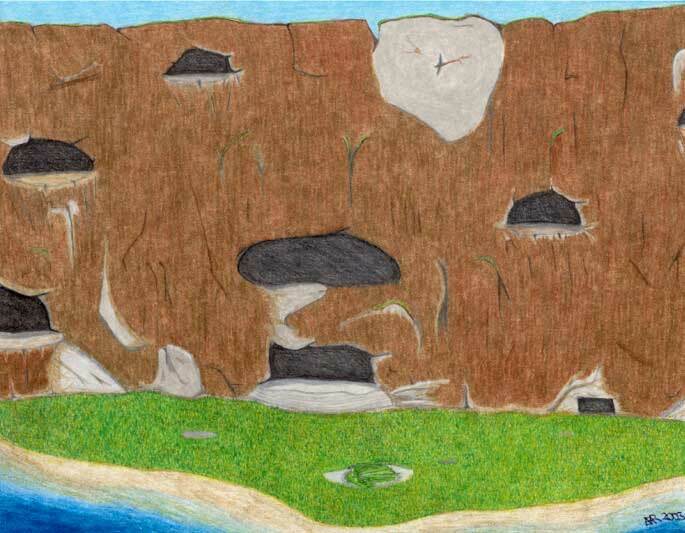 The wher dens, drawn by Nerissa on June 22, 2006. Unless otherwise indicated, the artwork on this page is copyright © Eleanor R. (Neshomeh) 2003-2006. This page last updated 6.22.06 by Nerissa.